One of our oldest designs is our Vintage collection. We are usually asked to make our stationery in quite neutral colours, but this collection looks better in darker, more bold colours like Black, Purple or Navy Blue as shown. Our Vintage design is made with a damask style print and on the invitation it is finished with a personalised plaque and diamante. We had previously made wedding invitations for this customer and they came back to ask us to make their on the day stationery in the same design and colour. We were asked to make some place cards with printed guest names also in navy blue and table name cards. 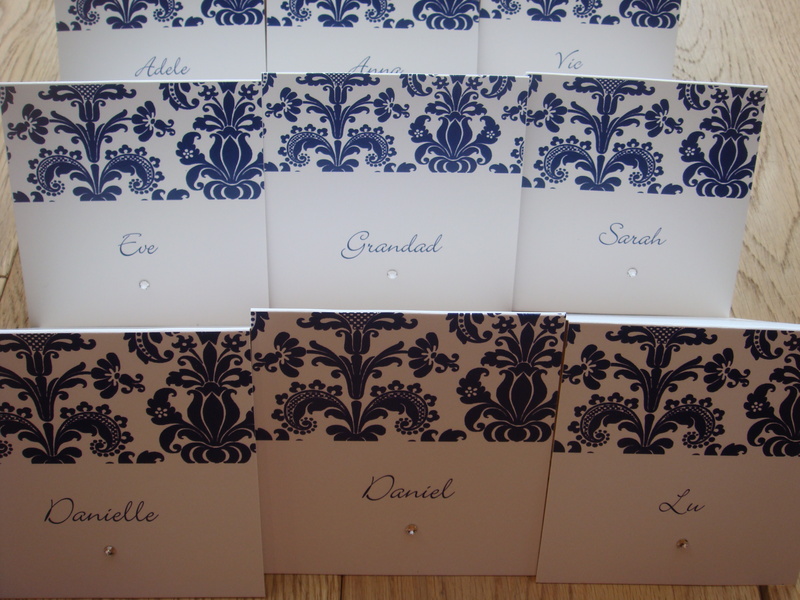 The wedding place cards come with guest name printing, the damask pattern and a diamante to finish it off. They measure 10 x 10 cm and can be made on White, Ivory or Cream card. To go with the place cards the customer ordered some table name cards which were named after cocktails. These are made in a tent style so they can be free standing or put in a table holder and the customer chose to have them measuring 14 x 14cm square. Normally we would provide these in an A5 size. The Vintage collection comes in a full range of stationery including wedding invitations, orders of service and table plans. The invites are available as a pocket, wallet, folded or flat card and can be made in your choice of colours. A photo of the pocket invitation is shown below. A full range of wedding stationery is available in this designs. Our Prestige collection has been on our books for quite a few years and is a popular choice with couples. 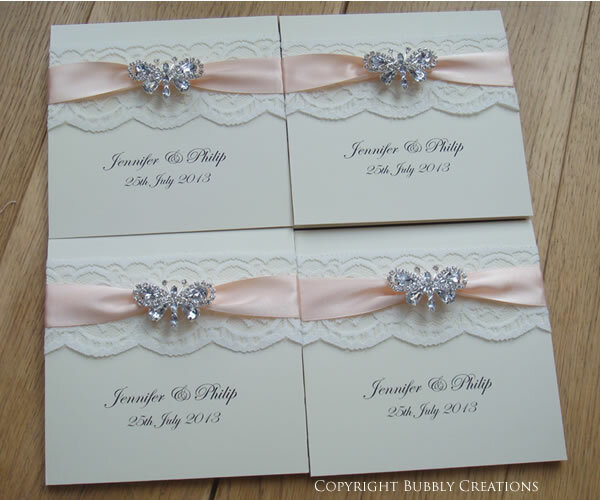 It is one of our more popular designs using luxurious lace, high quality ribbon, card, a pearl and diamante embellishment and fits in fantastically with a vintage or lace and pearls wedding theme which is so common at the moment. All of our designs are available in a selection of styles including a pocket which includes an RSVP card (the style shown here), Wallet, Folded or Flat card and each collection comes in a variety of colours so we can make them in your chosen colour scheme. The base card is available in White, Ivory or Cream. To see all the embellishments and ribbon colours available visit our website. For the Prestige price list and all the stationery available in this design please visit the Prestige page. Our featured design in this post is our Glamour collection with the customer ordering folded wedding invitations with matching place cards. The Glamour design consists of luxurious lace and a satin bow with a crystal cluster mounted on top of the ribbon. It if finished with the couples personal details and it is a popular choice with anyone using lace and also want a touch of sparkle on their wedding day. Elise contacted us from Norway after seeing the Glamour collection and asked us to make her wedding invitations. She chose to have the design made in white with rose pink ribbon which looked romantic and really showed off the embellishment. For us this order was a little different as the couple are from Norway and needed all the wording printed in Norwegian. Printing in another language is no problem and there is no extra cost for this service, all we ask is that you send the wording electronically so we can copy it over to our templates. We have made quite a few orders over the years in different languages including Greek, Russian, French, Spanish, Norwegian and German to name a few. We also do place cards to match all of our wedding invites and in the Glamour design there are two styles to choose from. The first is with lace, a satin ribbon bow and the Glamour diamante embellishment or we can do them with just the lace and ribbon which is more budget friendly. We also print the guest names free of charge. To see the full price list and all the stationery available in this collection please visit our Glamour design page or visit our stationery gallery to see our full range. Our Manhattan wedding invitation is one of our more classic designs, but with a little more sparkle using the glass embellishment. It can be made in any colour as we have a large range of satin ribbons to choose from and you can change the glass embellishment to a pearl if you prefer. This stationery collection is a classic, traditional design and is really popular with couples due to its simplicity. It comes with a large satin bow and is finished with either a crystal or pearl oval embellishment. We recently completed an order in our Manhattan range for evening invitations using cadbury purple ribbon on ivory card with the glass, oval embellishment. All of our invites are made to order so the embellishment can be changed, made in your colour scheme as the ribbon is available in a huge range of colours and you can choose to have White, Cream or Ivory card as the base. It is finished with your personal details and comes with an envelope. Each range is available in a full range of wedding stationery including table plans, Menu’s, Place Cards and Thank You Cards. For a full range of stationery items and a price list please visit the Manhattan design page or visit www.bcweddinginvitations.co.uk to view our full range of collections. Our Romance collection has been around for many years and is a popular choice for couples wanting a classic style pocket invite without any bling. This collection is ideal for anyone wanting a classic, traditional wedding invitation in a simple style. The design consists of a satin ribbon bow, a square mount with the couples initials and a single swarovski crystal. The inside has a co-ordinating coloured backing card and an RSVP card and envelope included. Measures 13 x 13cm. This is a really popular style of invite due to its timeless style and classic elements. It can be made in almost any colour scheme so it completely versatile. All of our wedding invitation designs are available in a variety of styles including a Pocket (which includes an RSVP card), Wallet, Folded of Flat style. We also have a large range of wedding stationery which can be made to match your wedding invites. This customer chose to have Violet ribbon with a Purple backing card on the inside and made with Ivory card. Click here to view any of our wedding invitation designs. Our Cupid design consists of a vintage style rose pattern in your chosen colour with a double layer of satin ribbon, again in your colour choice and is finished with a pearl embellishment. This design is really popular with couples have a vintage floral theme and is especially popular for spring weddings. We were asked to make some Menu’s and a Wedding Table Plan for a wedding in March featuring pink and pearls. The customer chose our Cupid design and changed the embellishment from a large round pearl embellishment to a smaller one with crystals around the edge which looked great. We also made a wedding seating plan for this customer to match the Menu’s. Prices vary depending on the design chosen and a full price list is available on our website for each wedding invitation design. The Bella design is available in a selection of colours including Pink, Fuchsia, Green, Black, Brown, White, Gold, Yellow, Purple along with some other colours. All the colours can be viewed on our website. There is a full range of wedding stationery available in this design including wedding invitations which are available as a pocket, wallet, folded or flat style depending on your choice. The butterflies are more limited, but the ribbon is available in almost any colour. The Bella design consists of an organza butterfly mounted on satin ribbon and finished with a trail of swarovski diamantes. This design is always popular for couples having a spring wedding. The featured order in this blog post is a wedding seating plan we completed for a customer getting married this month in our Bella design in her chosen colours of White and Royal Blue. 3) An extra large table plan (up to 20 tables plus top table). They are made on white stretched canvas boards and have a depth of 1.5cm. They are finished off with a layer of matching satin ribbon around the edge. This customer also ordered her wedding invitations from us and asked to have a larger folded invite (approx A5 in size) and had a paper insert with three printed sides. She chose to have the wedding invitation wording, menu choices and a gift poem printed.